Best experience I had in Bali! Pack light and bring some snacks. It’s tough but worth to try. Out guide, Yoga, was exceptional! He was kind and friendly. Patiently waited us when we needed to take a break and helped us when the trekking course got harder. Also, he took a great photo of us! The nature itself was sufficient but the guide made even more unforgettable memories in Bali! Hike up to the top of the picturesque Mount Batur (Kintamani Volcano) on a 10-hour sunrise trek and be rewarded with dramatic views of Bali’s mountainscapes as you munch on a delicious breakfast at the top. You probably won’t get a lot of sleep on the night of the tour — you will need to be ready in time for your 2am hotel pick up. 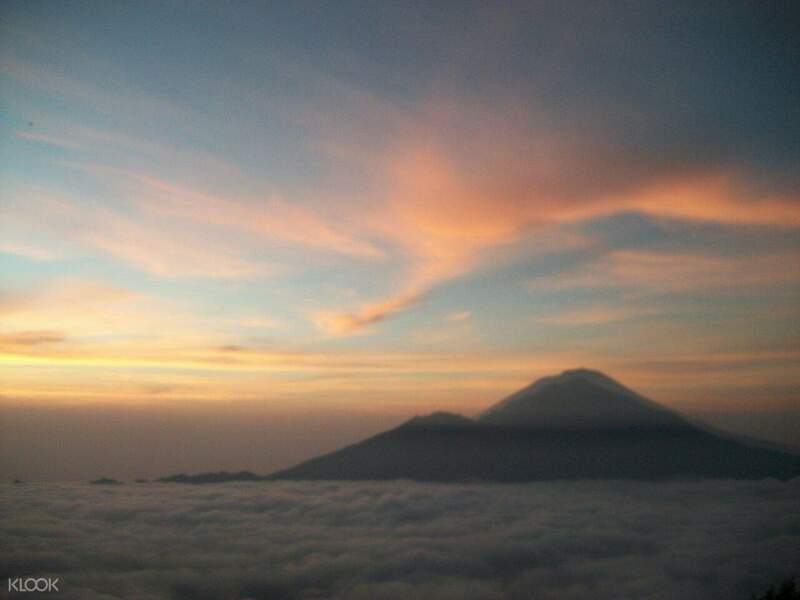 Go through a short safety briefing before embarking on your Mount Batur Sunrise Trek. 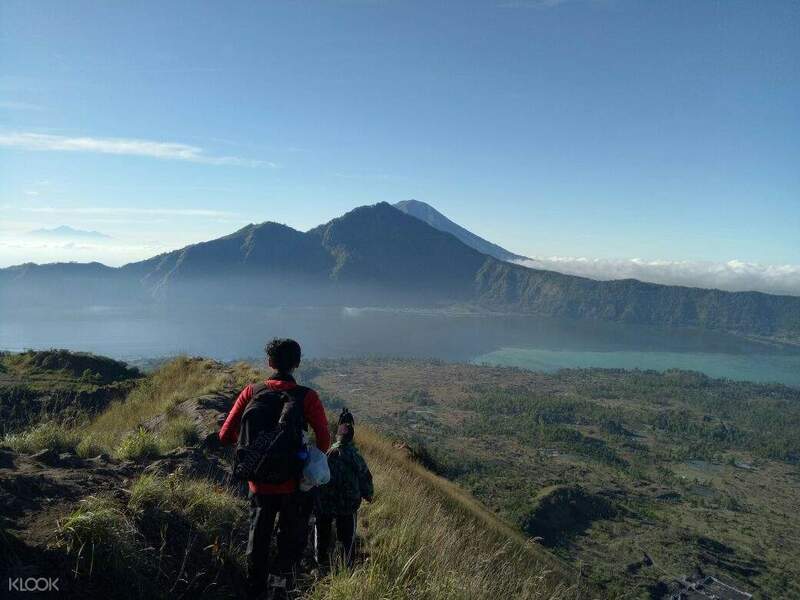 It will take you about three hours to get to the top and, once there, you will get to combine breathtaking views from the peak of Mount Batur with a delicious local breakfast. After, you will trek down the mountain and visit a beautiful coffee plantation along the way. An amazing experience! The driver arrived punctual and he already waited us after the trekking. The tour guide was super nice and helpful during the trekking. He took us some photos. The coffee plantation was interesting. An amazing experience! The driver arrived punctual and he already waited us after the trekking. The tour guide was super nice and helpful during the trekking. He took us some photos. The coffee plantation was interesting. We booked for a private tour of 3 and the driver arrived ~10mins earlier at our place to pick us up. The drive took us ~1.5hrs, where we got to meet the guide at the mountain base. The guide was very nice to help us up certain part of the route where it gets a bit more challenging after mid point. Breakfast was served while we waited for the sunrise and the view was nice even though the weather was cloudy. It was drizzling when we were going down so the steps were slippery; we had to be more cautious. After the sunrise tour, we went to a coffee plantation to have a taste of different types of coffee and drinks. The sunrise tour was definitely a must to go. As for the coffee plantation, you can just go and take a look but probably won't need to stay long. We booked for a private tour of 3 and the driver arrived ~10mins earlier at our place to pick us up. The drive took us ~1.5hrs, where we got to meet the guide at the mountain base. The guide was very nice to help us up certain part of the route where it gets a bit more challenging after mid point. Breakfast was served while we waited for the sunrise and the view was nice even though the weather was cloudy. It was drizzling when we were going down so the steps were slippery; we had to be more cautious. After the sunrise tour, we went to a coffee plantation to have a taste of different types of coffee and drinks. The sunrise tour was definitely a must to go. As for the coffee plantation, you can just go and take a look but probably won't need to stay long. The trekking is extraordinary, yet it can be a bit challenging to people who do not do much exercise. I would recommend to sign up for private tour because the tour guide can take better care of you. Our tour guide was super helpful and took care of us very well. Thanks to her, we have safely finished the trekking. Also, our driver, Radiasa, is so friendly and punctual too. He brought us to some villages which are specialising in different craftsmanship. Greatly appreciated! The trekking is extraordinary, yet it can be a bit challenging to people who do not do much exercise. I would recommend to sign up for private tour because the tour guide can take better care of you. Our tour guide was super helpful and took care of us very well. Thanks to her, we have safely finished the trekking. Also, our driver, Radiasa, is so friendly and punctual too. He brought us to some villages which are specialising in different craftsmanship. Greatly appreciated! Great experience overall! I would definitely recommend this activity. Our tour guide in Mt. Batur is very accommodating. He carefully assisted us through our hiking, especially when going down, it is very slippery because of the small rocks. We went to the luwak coffee plantation and it is the best after the tiring event at Mt. Batur. We made friends with the staffs there and they are very kind to explain everything we asked! The driver is very accommodating and assisted us in our requests. And since we had enough time, he offered us to stop over to Tegalalang RiceTerrace and we had a quick view and picture taking. Overall experience was great. We would like to do this again in the future! Great experience overall! I would definitely recommend this activity. Our tour guide in Mt. Batur is very accommodating. He carefully assisted us through our hiking, especially when going down, it is very slippery because of the small rocks. We went to the luwak coffee plantation and it is the best after the tiring event at Mt. Batur. We made friends with the staffs there and they are very kind to explain everything we asked! The driver is very accommodating and assisted us in our requests. And since we had enough time, he offered us to stop over to Tegalalang RiceTerrace and we had a quick view and picture taking. Overall experience was great. We would like to do this again in the future! Prior reaching our hotel, Driver made a call to inform us to get ready. The guides were very helpful, holding my hand up and down the climb to Ensure I am safe. The guides seek approval from everyone of us to the sat below the summit because we might miss sunrise if we were to continue climbing to the summit and it may be crowded. We were given a bottle of 500ml water, bread with banana spread and hard-boiled egg! It was really an enjoyable experience. Prior reaching our hotel, Driver made a call to inform us to get ready. The guides were very helpful, holding my hand up and down the climb to Ensure I am safe. The guides seek approval from everyone of us to the sat below the summit because we might miss sunrise if we were to continue climbing to the summit and it may be crowded. We were given a bottle of 500ml water, bread with banana spread and hard-boiled egg! It was really an enjoyable experience. 10/10 great hike, great guides, great view. It is really cold at the base and at the top of the moutain, good to have a windbreaker at least. The view is really pretty and breakfast was served when we reached the peak. Going up was easier than coming down - requires thigh power. While going down, it was really slippery. Kept sliding but thankful for the guide who held my hand throughout the journey down. Cheers to all the guides - they are really thoughtful and attend to our needs. There are multiple peaks to catch the sunrise and it all depends on your group’s speed. The guides also brought us to look at monkeys, crater and cave. After the hike, we also visited the coffee plantations and tried out coffees and teas. 10/10 great hike, great guides, great view. It is really cold at the base and at the top of the moutain, good to have a windbreaker at least. The view is really pretty and breakfast was served when we reached the peak. Going up was easier than coming down - requires thigh power. While going down, it was really slippery. Kept sliding but thankful for the guide who held my hand throughout the journey down. Cheers to all the guides - they are really thoughtful and attend to our needs. There are multiple peaks to catch the sunrise and it all depends on your group’s speed. The guides also brought us to look at monkeys, crater and cave. After the hike, we also visited the coffee plantations and tried out coffees and teas. It was an awesome experience as it was also our first time trekking up Mr Batur in Bali to see sunrise. The guides with us were very friendly, experienced an extremely helpful in taking care of anyone who has difficulty to move on thus ensuring everyone can reached the peak of the mountain eventuality. No doubt the climb was tough but once you reached the peak of the mountain, it was definitely rewarding as you can see the beautiful scenery and sunrise. We were also served with white bread stuffed with mesh bananas and an hard boil egg for breakfast. Breakfast really good. 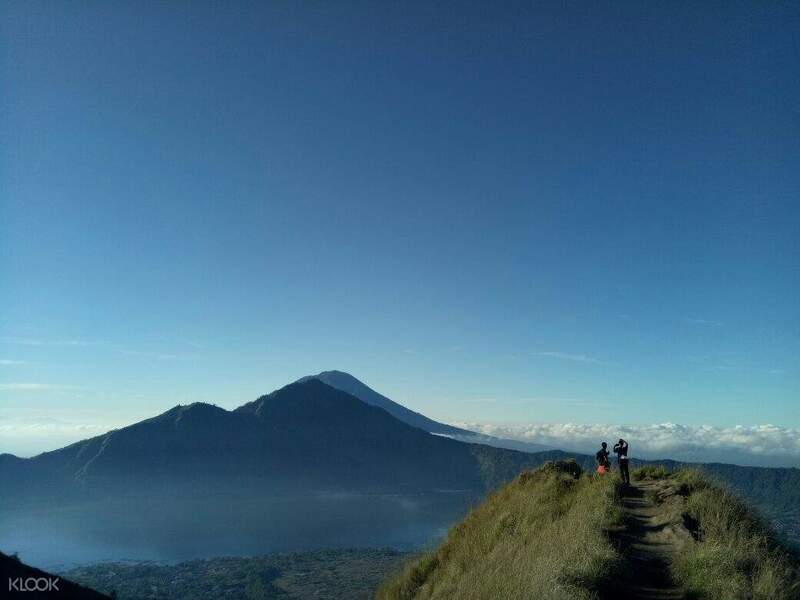 Besides taking pictures of the beautiful scenery, the guides also bring us to see the Mount Batur crater. Overall, we enjoyed the whole activity and also test our limits to climb to the peak of the mountain. It was an awesome experience as it was also our first time trekking up Mr Batur in Bali to see sunrise. The guides with us were very friendly, experienced an extremely helpful in taking care of anyone who has difficulty to move on thus ensuring everyone can reached the peak of the mountain eventuality. No doubt the climb was tough but once you reached the peak of the mountain, it was definitely rewarding as you can see the beautiful scenery and sunrise. We were also served with white bread stuffed with mesh bananas and an hard boil egg for breakfast. Breakfast really good. Besides taking pictures of the beautiful scenery, the guides also bring us to see the Mount Batur crater. Overall, we enjoyed the whole activity and also test our limits to climb to the peak of the mountain. Pre-trip notification and pick-up information by the local operator came at only about 10pm, which could have been given earlier during the day. The pick-up by the driver Wayan was on time, and then we picked up another couple also in the Ubud area before an hour’s drive to the start point of the trek. It is already low season in Bali, but overall there were still many other participants. We were then placed into groups of about 5-6 people and each group was led by a guide. My group’s trekking guide was another Wayan. It wasn’t too cold on 3 Dec so we didn’t need windbreakers/jackets. The journey up Batur was somewhat challenging, so we were perspiring in no time. Once we arrived at a plateau near the summit, we had the option of staying put, or go further up to the summit which we were told would take another 25-30 minutes. My group and most other groups chose to remain on the plateau, where we took photos and rested. It was a cloudy morning so our sunrise wasn’t fantastic, though the scenery was still impressive. We took a more gently sloping, winding route on the descent. Wayan explained some of the features in the Batur area and also answered some of our questions relating to his work as a mountain guide. We were then led to a rest point near a paved road which is about halfway up to the mountain, where we met driver Wayan again. The couple and I have already been to a coffee plantation on a separate itinerary so we asked to be driven back into Ubud directly from Batur, and we arrived back in Ubud around 8.30am. Pre-trip notification and pick-up information by the local operator came at only about 10pm, which could have been given earlier during the day. The pick-up by the driver Wayan was on time, and then we picked up another couple also in the Ubud area before an hour’s drive to the start point of the trek. It is already low season in Bali, but overall there were still many other participants. We were then placed into groups of about 5-6 people and each group was led by a guide. My group’s trekking guide was another Wayan. It wasn’t too cold on 3 Dec so we didn’t need windbreakers/jackets. The journey up Batur was somewhat challenging, so we were perspiring in no time. Once we arrived at a plateau near the summit, we had the option of staying put, or go further up to the summit which we were told would take another 25-30 minutes. My group and most other groups chose to remain on the plateau, where we took photos and rested. It was a cloudy morning so our sunrise wasn’t fantastic, though the scenery was still impressive. We took a more gently sloping, winding route on the descent. Wayan explained some of the features in the Batur area and also answered some of our questions relating to his work as a mountain guide. We were then led to a rest point near a paved road which is about halfway up to the mountain, where we met driver Wayan again. The couple and I have already been to a coffee plantation on a separate itinerary so we asked to be driven back into Ubud directly from Batur, and we arrived back in Ubud around 8.30am. No words can describe how grateful I am for Klook for giving me this chance to trek Mount Batur. We wanted to do it on the 2nd day of our trip but we overslept due to our flight delay during our first trip. I sent several emails and even fb messaging them asking for help. Was so so grateful that them helped me to reschedule it on the 3rd day of our trip. The guides there were amazing and they took really good care of us when we were there. The view was magnificent too! You will never regret if you try it! No words can describe how grateful I am for Klook for giving me this chance to trek Mount Batur. We wanted to do it on the 2nd day of our trip but we overslept due to our flight delay during our first trip. I sent several emails and even fb messaging them asking for help. Was so so grateful that them helped me to reschedule it on the 3rd day of our trip. The guides there were amazing and they took really good care of us when we were there. The view was magnificent too! You will never regret if you try it!